Cheng Man-ch'ing or Zheng Manqing (29 July 1902 - 26 March 1975) was born in Yongjia (present-day Wenzhou), Zhejiang Province (his birthday was on the 28th year of the Guangxu emperor's reign, 6th month, 25th day, which corresponds to July 29, 1902). He died March 26, 1975; his grave is near the city of Taipei. Cheng was trained in Chinese medicine, t'ai chi ch'uan, and the three perfections: calligraphy, painting and poetry. Because of his skills in these five areas (among some of the traditional skills and pastimes of a Confucian scholar in traditional China) he was often referred to as the "Master of Five Excellences." Because he had been a college professor, his students called him "Professor Cheng." Cheng Man-ch'ing. T'ai Chi Ch'uan teacher and creator of Yang Style Short Form (37 Postures). Cheng's father died when Cheng was very young. Around the age of nine, Cheng was struck on the head by a falling brick or roof tile, and was in a coma for a short while. He recuperated slowly, and was apprenticed to a well-known artist, Wang Xiangchan, in hopes that simple jobs like grinding ink would help his health. Within a few years, his teacher sent him out to earn his living at painting. Cheng's aunt Chang Kuang, also known by her artist's name of Hongwei Laoren, was a well-known painter. During Cheng's childhood, his mother took him out to find medicinal plants and taught him the fundamentals of traditional Chinese herbal medicine. Cheng taught poetry and art in several leading colleges in Beijing and Shanghai and was a successful artist. At the age of nineteen, he was a professor of poetry at an esteemed art school in Beijing. Later in Shanghai, he became acquainted with influential figures including Wu Changshi, Cai Yuanpei, Zheng Xiaoxu, Xu Beihong, and Zhang Daqian. In his twenties, he developed lung disease (believed to be tuberculosis partly from exposure to the chalk dust from the school blackboards). Ill to the point of coughing up blood, he began to practice t'ai chi ch'uan more diligently to aid his recovery. Cheng retired from teaching and devoted himself for several years to the study of t'ai chi ch'uan, traditional Chinese medicine, and literature. In addition to his childhood instruction, Cheng Man-ch'ing received formal Chinese medical training. While he was teaching painting in a Shanghai art school, one of his friends grew ill and was unable to find relief. Cheng Man-ch'ing wrote a complex prescription for his friend, who took the medicine and recovered fully. One story from his memorial book is that a retired traditional doctor named Song You-an came across the prescription. He demanded to be put in contact with the person who wrote it, as the sophistication and erudition of the prescription showed exceptional talent and competence. As war was raging across China at that time, it took several years before Cheng Man-ch'ing was able to present himself for study. With Song, Cheng received instruction and became conversant with the Chinese pharmacopoeia. Around 1930 Cheng met the well-known master Yang Chengfu (1883–1936), with whom he began to study Yang-style t'ai chi ch'uan, until Yang died. While the exact dates of Cheng's study with Yang are not clear, one of Yang's top students, scholar Chen Weiming wrote that Cheng studied six years with Yang.. Cheng, according to Yang's son Zhenji, ghostwrote Yang's second book Essence and Applications of Taijiquan or The Substance and Application of T'ai Chi Ch'uan (Taijiquan tiyong quanshu, 1934), for which Cheng also wrote a preface and most likely arranged for the calligraphic dedications. Cheng taught t'ai chi ch'uan, practiced medicine, and continued his art practice in Sichuan Province during the Sino-Japanese war years. In this period he taught Abraham Liu while at the Central Military Academy, China's equivalent of West Point. [Reference 1 At age 32 he taught t'ai-'chi ch'uan at the Central Military Academy (formerly the Huang-po Military Academy -equivalent to West Point in the United States. )"]By 1946, he had developed a significantly abbreviated 37-move version of Yang's traditional form. He wrote the manuscript for his Thirteen Chapters during this period, and showed them to his elder classmate Chen Weiming, who gave it his imprimatur. Cheng moved to Taiwan in 1949 and continued his career as a physician and as a teacher of his new t'ai chi ch'uan form, as well as actively practicing painting, poetry, and calligraphy. He published Cheng's 13 Chapters of T'ai Chi Boxing in 1950 which has been translated into English twice. He started the Shih Chung T'ai Chi Association in Taipei, where many now well-known students (Benjamin Lo, Liu Hsi-heng, Hsu I-chung, dr Qi Jiang Tao, Robert W. Smith, T. T. Liang, William C. C. Chen, Huang Sheng Shyan and others) trained with him. Though he tended not to advertise it, Cheng served as one of the painting teachers of Soong Mei-ling, Madame Chiang Kai-shek, whom he taught to paint lotuses; and as personal physician to Chiang Kai-shek in Taiwan and perhaps earlier. In 1964, Cheng moved with his family (Madame Cheng, two sons, and three daughters) to the United States, where he taught at the New York T'ai Chi Association at 211 Canal Street in Manhattan. He then founded and taught at the Shr Jung T'ai Chi school at 87 Bowery in New York City's Chinatown section, with the assistance of his six American senior students, known as the "Big Six": Tam Gibbs, Lou Kleinsmith, Ed Young, Mort Raphael, Maggie Newman, and Stanley Israel. (Some students of that era say that there were the Five Senior Students, plus Stanley Israel in the second level.) Later students/assistants are known as "the Little Six": Victor Chin, Y Y Chin, Jon Gaines, Natasha Gorky, Wolfe Lowenthal, and Ken VanSickle. Other American students include Frank Wong, Michael and Lora Howard, Herman Kauz, Renee Houtrides, Patt Benton, Lucjan Shila, Carol Yamasaki, Robert Ante, Judyth Weaver, Patrick Watson, Min Pai, Lawrence Galante, Lisa Marcusson, Saul Krotki, Robert Chuckrow, Robert D. Morningstar and William C. Phillips. In Taiwan, Cheng's students continued running the school in his absence. It operated initially under the direction of Liu Hsi-heng. Hsu I-chung is the current director. While living in New York City, Cheng often spent several hours in the early afternoons studying or teaching classes of three or four students in the C. V. Starr East Asian Library in Columbia University, usually in a small, mahogany-panelled loft above the main floor. For relaxation, he raised orchids. In 1967 in collaboration with Robert W. Smith, and T. T. Liang, Cheng published "T'ai Chi, the Supreme Ultimate Exercise for Health, Sport and Self-defense," which was his second t'ai chi book in English. He wrote over a dozen other books on a variety of subjects, including the I Ching, the Tao Te Ching, the Analects of Confucius, books of poetry, essays, medicine, and art collections. Translations of his works include: "Master Cheng's New Method of T'ai Chi Ch'uan Self-Cultivation"; "Cheng Man Ch'ing: Essays on Man and Culture"; "Cheng Man Ch'ing: Master of Five Excellences," and "T'ai Chi Ch'uan: A Simplified Method of Calisthenics for Health and Self-Defense." Cheng also produced several t'ai chi films, and some of his classes and lectures were recorded and in later years released on DVD. Cheng Man-ch'ing is best known in the West for his t'ai chi ch'uan. The following are some of the characteristics of his "Yang-style short form." Cheng postures are performed in "middle frame" style, which changes the movement of the feet from the Yang version. Cheng's concept of "swing and return" in which the momentum from one movement initiates the next. These changes allowed Cheng to teach larger numbers of students in a shorter time. His shortened form became extremely popular in Taiwan and Malaysia, and he was one of the earliest Chinese masters to teach t'ai chi ch'uan publicly in the United States. His students have continued to spread his form around the world. 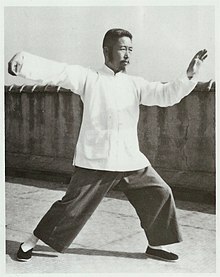 It should be noted that Cheng rejected the appellation "Yang-style Short Form" to characterize his t'ai chi. When pressed on the issue, he called his form "Yang-style t'ai chi in 37 Postures." However, the postures in his form are counted differently from those in the Yang Chengfu form. In the older form each movement counts as a posture, whereas in the Cheng form postures are counted only the first time they are performed, and rarely or not at all when they are repeated. Moreover, certain postures which appear in the Cheng form, such as High Pat on Horse, are not counted at all. These differences in how the postures are counted have led some Cheng practitioners, such as William C. C. Chen, to characterize their own forms as exceeding 70 "movements," and indeed, upon close comparison with the Yang Chengfu form, Cheng's postures, if counted the same way as Yang's are, would number over 70. Moreover, there is nothing in Cheng's teaching to prohibit a practitioner of his style from repeating any number of movements just as many or more times than they are repeated in the Yang Chengfu form. Cheng's changes to the Yang-style form have never been officially recognised by the Yang family and (perhaps partly because of the continued popularity of Cheng's shortened form) his style is still a source of controversy among some t'ai chi ch'uan practitioners. From Cheng's own point of view, the approval of his elder brother disciple Ch'en Wei-ming was all the recognition he needed, since by that time Yang Chengfu was deceased, and all of the current generation of Yang Chengfu leaders were junior to him. A little-appreciated dimension of Cheng's legacy was his willingness to teach non-Chinese students. While he was not the first Chinese martial artist to do this in America, his warm embrace of Westerners, who ran the gamut from experienced fighters to long-haired hippies of the day, proved controversial with the Chinese Association that had initially sponsored his move to New York. At one point, when Cheng was out of the country, the Association members locked the Western students out of the Canal Street school. Informed of this, Cheng instructed Ed Young to find a new location. Upon his return to New York, Cheng taught at the new location, 87 Bowery, sending an unmistakable message of inclusiveness and rejecting the insularity that was traditional in the Chinese martial arts community. In New York City, among Cheng's senior students, Maggie Newman and Ed Young are still teaching. While Prof. Cheng was still teaching in New York, he asked Fred Lehrman to help initiate schools in Milwaukee WI, Minneapolis MN, Gainesville FL, Boulder CO, and Halifax, Nova Scotia. Among these, the ones in Milwaukee and at Naropa Institute in Boulder have continued into the new millennium. The official program at Naropa Institute had over 500 students in the first Tai Chi summer session in 1975 and included several of the main Shih Jung teachers, including Lehrman, Tam Gibbs, Maggie Newman, Ed Young, and Wolfe Lowenthal as visiting instructors over the next period of years, in addition to resident teachers Jane and Bataan Faigao. The Faigaos also established Rocky Mountain T'ai Chi Ch'uan in Boulder. The New York School of Tai Chi Chuan, later the T'ai Chi Foundation, was founded by Patrick Watson at the request of Prof. Cheng. William C. Phillips operates Patience T'ai Chi Association in Brooklyn, NY. Don Ahn founded the Ahn T'ai Chi Studio and taught thousands of students form and Taoist techniques. Cheng's students carried on his tradition of writing about t'ai chi, creating study material, and documenting his teaching. A recent feature film "The Professor" documents his years in New York City. ^ Most of the information in this article can be found in Cheng's memorial book, a translation of which can be found at: Gibbs, Tam (2 November 1978). "Cheng Man Ching: A Life Biography by Tam Gibbs". Sinobarr Productions Homepage. Retrieved 2 April 2015. ^ Yang, Zhenji. Yang Chengfu shi taijiquan. Guangxi Minzu Chubanshe. p. 250. ^ Chuckrow, Robert. "Ph.D." The Tai Chi Book. YMAA Publication Center. Retrieved 25 April 2012. ^ Patrick A Kelly (2004). Relax, deep mind: Taiji basics. ISBN 978-0-476-00425-2. Training manual in the Taiji system of Huang Xingxian (p.16). ^ Patrick A Kelly (2007). Infinite Dao. ISBN 978-0-473-13049-7. A record of 20 years training with Huang Xingxian (p.77). ^ Naropa Institute course catalogs. Cheng Man-ch'ing. See "Zheng Manqing" entry for selected Chinese titles. Cheng Man-ch'ing. [ Cheng Man-ch'ing Videos . (2007). Set of 1960s videos on DVD of Cheng teaching in New York City. http://www.chengmanching.com]. Cheng Man-ch'ing. Cheng-tsu's Thirteen Treatises on T'ai Chi Ch'uan . Translated by Benjamin Lo and Martin Inn. Berkeley: North Atlantic Books (1985). Cheng Man-ch'ing, and Robert W. Smith, T'ai Chi Rutland, VT: Tuttle, 1967. Chuckrow, Robert; The Tai Chi Book-Refining and Enjoying a Lifetime of Practice . ISBN 1-886969-64-7. A CMC Shr Jung NYC Student. Davis, Barbara; "In Search of a Unified Dao: Zheng Manqing's Life and Contributions to Taijiquan." In Journal of Asian Martial Arts, v.5, n. 2, p. 36-59. Kauz, Herman; Tai Chi Handbook . ISBN 0-385-09370-5. A CMC Shr Jung NYC Student. Lowenthal, Wolfe; There Are No Secrets: Professor Cheng Man-Ch'Ing and His Tai Chi Chuan . ISBN 1-55643-112-0. A CMC Shr Jung NYC Student. McFarlane, Stewart The Complete Book of T'ai Chi . DK Publishing, New York (1997). ISBN 0-7894-1476-7, paperback ISBN 0-7894-4259-0. Covers only the 37 Form of Cheng Man-ch'ing's tai chi; illustrated drawings. Strugatz, Barry, director. "The Professor: Tai Chi's Journey West" ASIN B01EU15ZIQ. First Run Features. Wile, Douglas. Zheng Manqing's Uncollected Writings on Taijiquan, Qigong, and Health, with New Biographical Notes. Milwaukee: Sweet Ch'i Press, 2007. Yang Chengfu. Taijiquan tiyong quanshu. 1934. Translated by Louis Swaim as The Essence and Applications of Taijiquan. 2005. ISBN 1-55643-545-2. Yang Zhenji, Yang Chengfu shi taijiquan Guangxi: Guangxi Minzu Chubanshe, 1993. Zheng Manqing. Zhengzi taijiquan shisan pian [Cheng-tzu's Thirteen Treatises on T'ai Chi Ch'uan] . Taiwan (1950). Zheng Manqing. Yi quan [The Complete I Ching] . Taibei: Meiya Publishing (1974). Zheng Manqing. Zheng Manran shuhua ji [Collection of Zheng Manran's Calligraphy and Painting]. Taibei: Zhonghua shuju (1971). Zheng Manqing.com A tribute site. "The Professor" Cheng Man-ch'ing documentary film. Site for the Shr Chung Tai Chi Chuan Association founded by Cheng. In Chinese and English. List of CMC form postures. List of CMC form postures in Chinese, Pinyin, English, German. Articles on T'ai Chi by a NYC student of Prof. Cheng. ChengTaiji, Shanghai, China. School of Huang Xingxian's disciple.